Money has no place in politics, goes the tired complaint (ironically, as money seems to have an increasing place in politics and politicians’ pockets), but what of money in the law? We often hear of generational change when it comes to the evolution of the legal profession into something more humanist, when it comes to women and LGBTI in the workplace, or the flexibility required for mothers and those suffering from mental health issues. We take issue with the cruelty of the old “chin up and deal with it” attitude—the lifestyle of getting wrong the so-called “work–life balance”—but what if there’s a niggling imbalance in the very way we work? Another oft-heard complaint is the rapacity of lawyers in charging their clients. Many a lawyer has borne the brunt of a client’s fury upon receipt of a bill, and I am not overgeneralising to say that some legal bills are unjustified swindling. But there must be some truth to the charge, so to speak, or why else the recently introduced Uniform Law and all other manners of professional regulation? I had recently quipped to some friends that not all lawyers are well-heeled (except I imagine some women, pursuant to whatever completely non-sexist company policy). Some lawyers even struggle financially, and I don’t mean the ones who only put themselves into financial straits. As with all things that involve daily human toil, lawyering is subject to the vicissitudes of the modern-day working life, the model of which has become, over the decades, increasingly larger in scale and corporate. And there’s the rub: in an age where public funds to legal aid are slashed, the power of private money dominates the concerns of the law and, undoubtedly if suspiciously unwittingly, the legal profession. There is nothing especially new about that phenomenon, of course, and the issue of power and money in law goes back to the institution’s origins. But today, the profession likes to talk about access to justice, creating a more transparent legal system, a more humane workplace for lawyers facing personal hardships, among other noble concerns. None of this is possible without fundamentally changing how the law operates, both as a public institution and professionally. Of course, one might argue in defence of the modern legal system that if corporates want to spend hundreds of thousands of dollars on enormously complex and time-intensive litigation, so be it. It’s their money and their prerogative. But this begs the question of how money and the power that comes with it fundamentally shape the legal system and the concerns and aspirations of the profession. We like to give some semblance of truth to the proposition that political democracy is one person, one vote. At the same time, we accept that politics involves a large degree of behind-closed-doors deals and cash—for the Right, it’s the unions backing the Left; for the Left, it’s the corporates backing the Right. At the same time as admitting to the reality of these backroom tactics, we have chosen to regulate money in politics, to stem the power of donors and unelected powerbrokers to peddle influence and manoeuvre the ship of state. Why can we not do the same with the law? To even imagine the proposition as a course of action is to demand a total overhaul of how our legal system operates and what we expect of those working in the profession. Our courts are public institutions, but the concept of legal aid—in matters private and commercial as well as criminal and family-related—would need to be radically expanded. Profitability, and with it the nature of how the legal profession operates, would need to be subordinated to the utility of law as a public good, not a privilege. This post doesn’t go so far as to offer any visions of that radically different future. There are brighter and more dedicated minds who can, and should, lend their wisdom and structure to such a vision. But the proposition takes each lawyer to task on the questions central to their work. I would go so far as to say that the legal profession cannot have a serious and honest conversation on the topic of mental health without addressing the systemic nature that money plays in driving the legal profession as a business (a taboo label for the profession) and the aspirations of its practitioners. Money lies at the heart of access to justice and what forms of justice are prioritised over others, and to whom we give voice for redress in our society, and whom we silence by the power of the dollar or its absence. If I might be forgiven pirating the concept of how one deals with grief, to deny the centrality of money in law and the profession’s woes is the first stage towards a perhaps begrudging acceptance that something far more substantive must be done than addressing largely (but not totally) peripheral issues of what causes anxiety and depression in the profession. If we want healthy practitioners, we must ask what role money should, and shouldn’t, play in the development of a more responsive and ethical legal system. “My lawyer’s such a lifeless tool” might be soon closer to the truth as the day approaches when your lawyer (or at least their paralegals) may well be tools. It’s not often that an amateur scribe like your humble author receives free, unsolicited advice on his writing. But Mr Robert Angyal of Queen’s Counsel has come to the aid – in this instance – of my Queen’s English! His tool: Plainglish (“Plain English” for the uninitiated — OK, that’s my term; check out Robert’s earlier post on lawyers’ lexicon). The patient: a blog post of mine and middling quality (I said I was humble) from 19 June 2015, which is republished here, in the left-hand column below. Without further ado, New Lawyer English presents “Mind Our Words Redux, or, Two Variations on a Theme of Plainglish”. Enjoy. It might not occur to one, at first thought, that all lawyers are multilingual: we speak English and a very peculiar dialect that, for convenience sake, I call law.Law is as much about rules and procedure as it is about language, and we might take for granted that, besides all of the Old French and Latin jargon, lawyers speak in an English where argument and precision are deliberately reinforced in how we choose words, formulate sentences and speak to others within the legal system. Our use of language might be by the by in our working lives, but lawyers need to be conscious of not only how language is used, but how it is understood. This reflective practice is critically important when dealing with clients, the majority of whom live lives in blissful ignorance of the meaning of propounding the contract, or the balancing of probative value and prejudice. There is skill in talking to, and not at or above, the uninitiated. Technicalities don’t need to be dressed up in nineteenth century turns of phrase to be concise and constructive. (Although lawyers do look sharp in their nineteenth century costumes.) Translation into plain English then is important. And consciously adjusting our language for the layperson has an additional and particularly valuable benefit: we can make our legal language more accessible, clearer and more democratic. Recently, I had the opportunity to put the above into practice. Teaching alongside fellow lawyers and legal academics in a program run by Melbourne Free University, I introduced a class of asylum seekers and refugees to core ideas in the theory and practice of law. Our material covered as much ground as a one hour, once a week class can across seven weeks, starting from the basics of law in Australia (how law is made, for instance) to the finer instruments of commercial, criminal and international law. Classes generally attracted between 20 and 30 students, and there was a team of English tutors as well. Students, the vast majority of whom had no legal background, enjoyed immersing themselves in not only English but the language of the law, made plain and approachable. Experiences of this kind are crucial, for a general population that deserves access to legal system and an understanding of that system’s workings, and for lawyers. It was equally rewarding and instructive, as we honed our ability to translate law. No small feat when handling a highly technical craft, with its principles and reasoning! The more reflective we are on our profession, the more we can build a relationship and uphold our responsibility to public. You might not have realised that lawyers speak more than one language. They speak English and, also, a very peculiar dialect of English that I call Law.The law consists of rules and procedures, which must be expressed in precise language. Because of this, when lawyers speak in Law to other lawyers, or make legal arguments, they consciously try to be precise. They choose words and structure sentences with care. Sometimes, they use old French and Latin terms that have specific meanings in Law. Lawyers must be aware that, while it’s OK to speak Law to other lawyers, non-lawyers might not understand Law. This awareness is critically important for lawyers when dealing with clients. Most clients don’t speak Law and thus are blissfully ignorant of the meaning of Law phrases like propounding the contract or balancing probative value against prejudice. Because of this, it requires skill to talk to non-Law speakers in terms they can understand. 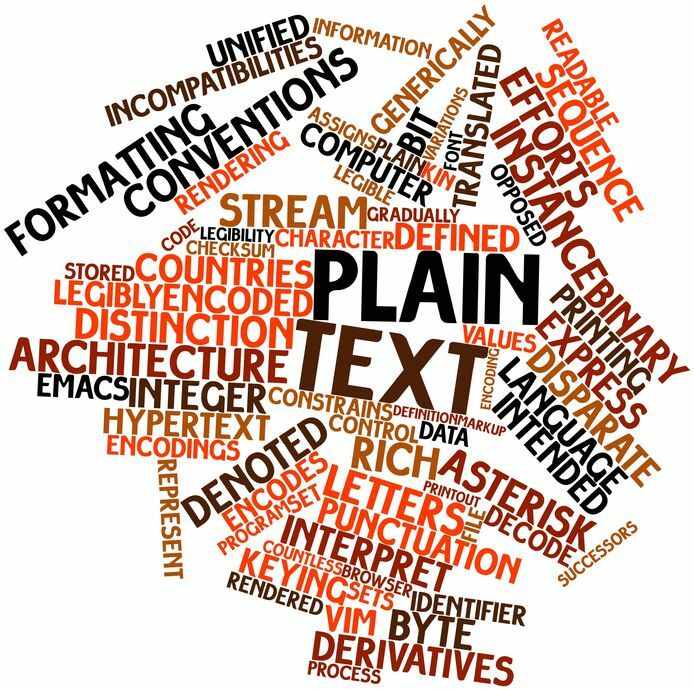 There are two skills needed to translate Law into plain English: (1) expressing technical ideas concisely and constructively; and (2) (while barristers look sharp in their 19th-century costumes) avoiding dressing up our language in 19th-century turns of phrase. While consciously translating Law for non-lawyers is challenging, it produces a particularly valuable additional benefit: It can make Law itself more clear and thus more accessible to non-lawyers. I recently had a chance to test whether this theory worked in practice. Teaching alongside fellow lawyers and legal academics in a program run by Melbourne Free University, I introduced a class of asylum seekers and refugees to core ideas in the theory and practice of law. The classes were an hour long, given weekly for seven weeks. In the time available, we covered as much ground as possible, from basic legal questions (such as how law is made in Australia) to complex concepts of commercial, criminal and international law. Usually between 20 and 30 students turned up. Very few of them had a legal background. With a team of English tutors to help them, the students enjoyed immersing themselves not only in English but also – once it was made plain and approachable – in the language of the law. Everyone deserves to understand how the legal system works and to have access to it. So, for non-lawyers, experiences of this sort are very important. The lawyers involved honed our ability to translate Law into English. Given the highly technical principles and reasoning involved, this was no small feat! As a result, the experience was equally instructive and rewarding for us. The take-away lesson? The more conscious we lawyers are of the need to communicate clearly, the better we can relate to non-lawyers and satisfy our professional duty to the public. 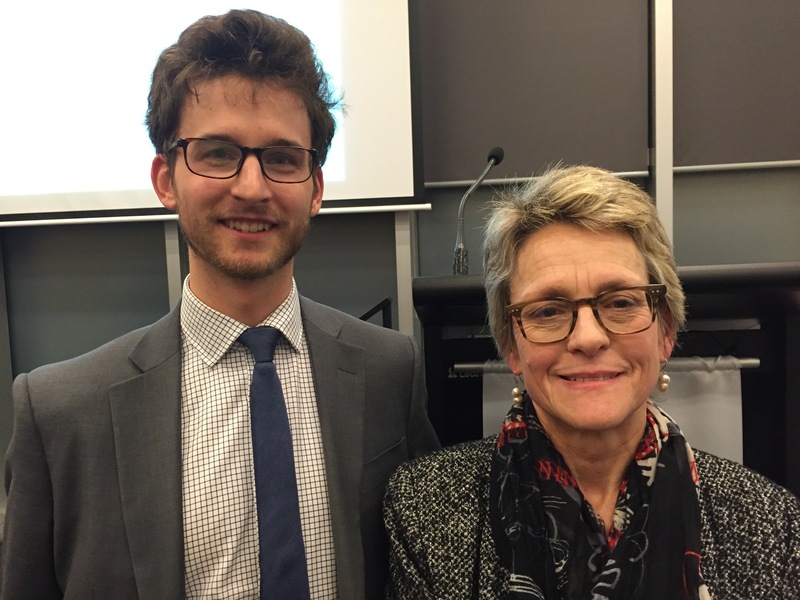 The recently appointed Honourable Associate Justice Mary-Jane Ierodiaconou keynoted the Tristan Jepson Memorial Foundation’s annual lecture held at Monash Law Chambers last Tuesday, October 6, 2015. TJMF co-founder Marie Jepson, Tristan’s mother, introduced her Honour to a packed room Tuesday night. Jepson also highlighted the Foundation’s mental health guidelines for the profession, saying the guidelines “provide a unique opportunity to leaders who want to leave a legacy and help to forge a new path”. Her Honour spoke on the theme of “Inspiring Change: Creating a Positive Workplace”, drawing on her experience as a founding partner at law firm Justitia and, in particular, in encouraging lawyers to adopt an “ethics of care” in the workplace. Specialisation Does Not a Lawyer Make? I had been recently discussing the future prospects for a generalist practitioner with a fellow young lawyer. Specialisation is the buzzword these days and every other lawyer appends to their legal practice some kind of niche – be it Property & Real Estate, M&A, Insolvency, and so forth. It might not occur to one, at first thought, that all lawyers are multilingual: we speak English and a very peculiar dialect that, for convenience sake, I’ll call law. Law is as much about rules and procedure as it is about language, and we might take for granted that, besides all of the Old French and Latin jargon, lawyers speak in an English where argument and precision are deliberately reinforced in how we choose words, formulate sentences and speak to others within the legal system. This reflective practice is critically important when dealing with clients, the majority of whom live lives in blissful ignorance of the meaning of “propounding the contract”, or the balancing of “probative value” and prejudice. There is skill in talking to, and not at or above, the uninitiated. Technicalities don’t need to be dressed in nineteenth century turns of phrase to be concise and constructive. (Although barristers do look sharp in their nineteenth century costumes.) Translation into plain English then is important. And consciously adjusting our language for the layperson has an additional and particularly valuable benefit: we can make our legal language more accessible, clearer and more democratic. Teaching alongside fellow lawyers and legal academics in a program run by Melbourne Free University, I introduced a class of asylum seekers and refugees to core ideas in the theory and practice of law. Our material covered as much ground as a one-hour, once-a-week class can across seven weeks, starting from the basics of law in Australia (how law is made, for instance) to the finer instruments of commercial, criminal and international law. 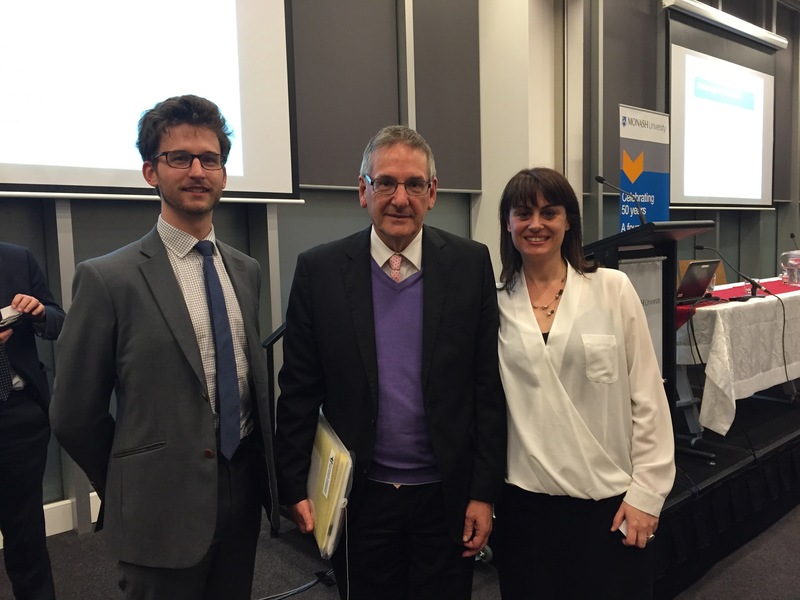 On the 12th May 2015, lawyers and educators met to celebrate the launch of the Monash Mental Health Front and Centre Wellbeing in the Law Initiative. 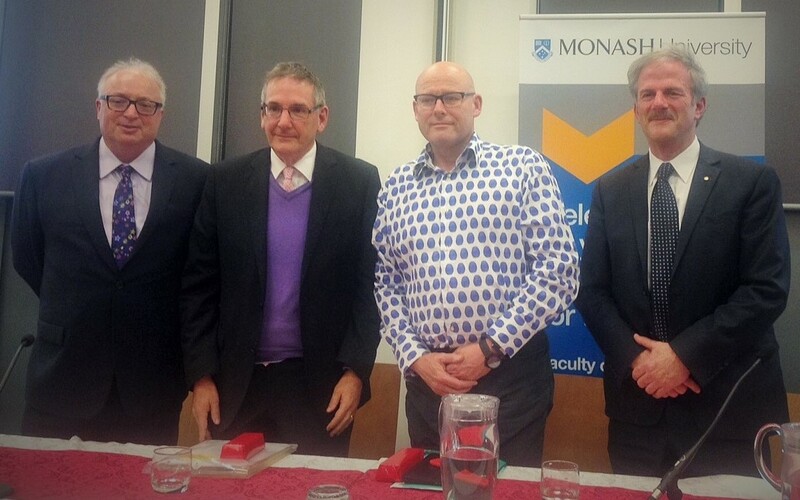 Panellists offered some “antidotes to the pressures” that lawyers and law students face alike at Monash Law School’s launch. The panel brought together some of the law’s top professionals – the Honourable Justice Shane Marshall of the Federal Court and King & Wood Mallesons partner John Canning – into conversation with Professor David Copolov OAM, Monash’s Pro Vice-Chancellor and a practicing psychiatrist, and Professor Bryan Horrigan, Dean of Monash Law School and the panel’s host for the hour-long panel discussion. Before the panel discussion got underway, Horrigan and Monash Law’s Student Experience Manager Lloyd England opened the evening with a launch of a YouTube video series (watch here) produced by the university to raise mental health awareness and mindfulness in the law. Monash Law School then recognised the efforts of the evening’s Guest of Honour, Marie Jepson, founder of the Tristan Jepson Memorial Foundation, which advocates for greater mental health awareness and support in the legal profession. 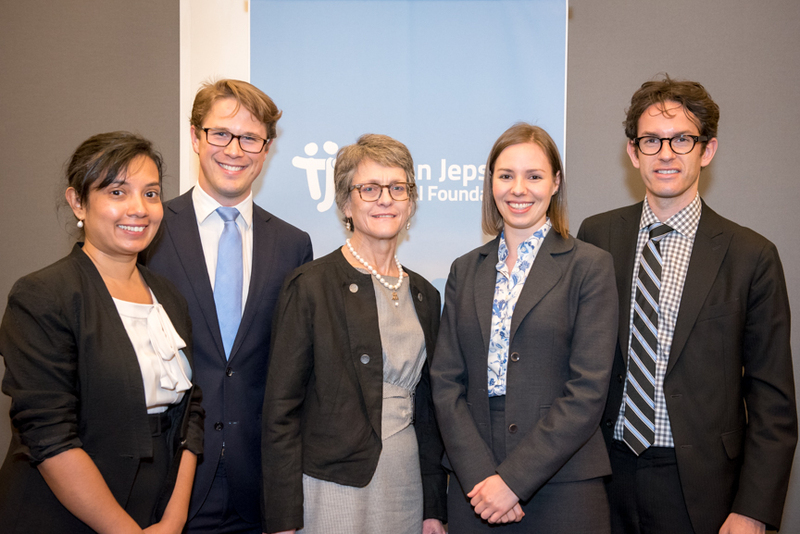 The Tristan Jepson Foundation recently introduced the “TJMF Psychological Wellbeing: Best Practices Guidelines” which the Foundation encourages law firms and other organisations to adopt and put into action. Monash Law School formally announced its adoption of the Guidelines on Thursday night, joining more than 100 organisations to sign onto the Guidelines to date. Jepson praised Monash Law School’s effort as “modelling leadership for others in the law”, adding that “there is no end point to this campaign” to push mental health into the limelight in the legal profession. With stress a well-known factor in the profession, a 2007 Beyond Blue survey found that 15 per cent of law students and lawyers suffer from “moderate to severe depression”. Other surveys report that around 20 per cent of barristers and 33 per cent of solicitors are depressed at some point in their career. Lloyd England, who introduced the panel, said that the statistics show that “mental health problems don’t end with the law degree”. Justice Marshall and Canning spoke to their personal, lengthy battles with mental health issues and how they learned to cope over time – and more importantly, how as they overcame difficulties, they could share their experiences in the hope of helping others suffering silently. “De-stigmatisation starts with the law students and lawyers of tomorrow”, Canning said, noting as well that, in his experience at Mallesons, “young people tend to talk more about mental health”. Panellists also shared their thoughts on strategies within the profession to change attitudes and support individuals with mental health issues. “It comes down to humanising the legal practice,” Copolov said. “The healthiest lawyers are those who report an intrinsic sense of moral satisfaction” and are collegial rather than overly adversarial. “It’s important to have a breadth of activities beyond the law and to seek support”, Copolov added. In the otherwise forgettable Wachowskis film Jupiter Ascending, one of the characters quipped in a perceptive moment, “Time is the single most precious commodity in the Universe”. proposition in respect of the legal profession. Time never seems to be in adequate supply for lawyers. We are constantly pressing up against deadlines and staying ahead of the increscent avalanche of emails and telephone calls. Yet there is a qualitative difference between time being a rare commodity and its being a precious commodity. In the age of instantaneous electronic communication, it’s fashionable to be “tech savvy”, checking emails as they arrive, pouncing on a new task or client’s question as soon as the phone rings or beeps or, according to modern tastes, barks like a rabid dog. Instead of complaining that we haven’t enough time to attend to a task or perform it well, we should ask whether we have made the right priorities. The Internet is replete with advice as to the downsides of multitasking and the one-stop shop that is the smartphone. The Age addressed the latter – replacing our smartphones with “dumb” phones – over the weekend. 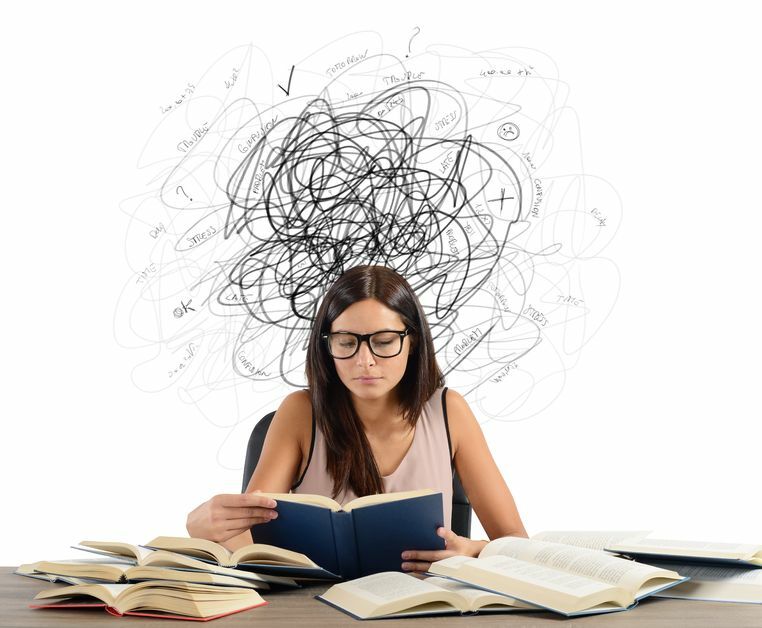 Lawyers should take heed: stress is not just the consequence of a highly intellectual job. It results as much from making time scarce by biting off more than one can chew. Our priority then ought to be quality. Quality takes time. We wouldn’t expect judges to provide poorly reasoned decisions churned out hastily. Likewise, we shouldn’t expect any less from ourselves and our colleagues in attending to tasks with a focus as to quality, not quantity. If that’s not enough to cause the modern lawyer concern, don’t forget that your digital multi-tasking can literally overload your brain. Some simple advice: put down the phone, pick up a pen and paper, and spend some time reasoning rather than reacting. If we grant that time is the most precious commodity in the Universe, then surely reason is stiff competition for the top billing. Clunky, imprecise and obtuse, poor legal writing is not an uncommon sight. It frustrates the layperson as much as the lawyer whose job it is to untangle the knots of ill reasoning and deadweight diction. How often then do lawyers remember that they are craftsmen? Perhaps because legal writing is highly technical, and often formulaic, some lawyers may think of themselves as technocrats and less as craftsmen. But the discerning lawyer is as much a craftsman with her writing as the tailor is in fitting a suit and the violinmaker in carving her wares. Every letter, e-mail, memorandum and the like should reflect an artisan’s touch. Reading the American sociologist Richard Sennett’s The Craftsman (a highly recommended read) brought to mind the importance of thinking of our work as a craft. So I would like to propose that the lawyer as craftsman can be an important exercise in self-reflection. Any craft demands patience and expertise, neither of which comes without discipline and practice. More importantly, we should derive pleasure from the work itself, and not treat each task, once completed, as another one off the list, or mere means to the next pay-cheque. Our goal as legal craftsmen lies somewhere between pith and precision. Often the task at hand easily accommodates both (despite perhaps our struggles). At other times, the waypoints are seemingly irreconcilable. Legal writing today has largely shed its more florid diction; the difficult task remains how do we capture meaning in the words we do employ. Sometimes, clarity requires a robust brevity, which is to say that our focus might not only be diction, but also sentence structure (syntax). That should be readily familiar to lawyers: after all, what is statutory interpretation but inexhaustible parsing of words and structure? In this sense, legal writing is distinct from, say, the journalist’s daily labours. Our writing may come in torrents of momentary genius or on the cusp of a critical deadline. But more often than not, we whittle away at a block of text with careful precision, and spend a considerable amount of time fine tuning the choice and placement of our words. Legal writing may seem formal, and our critical reasoning cool and detached. Yet the legal reasoning underlying our writing requires empathy and contemplation in order to thrive. Legal writing without those qualities is soulless, and soulless craft should be left to the auditors’ spreadsheets! Like every craft, written communication is also a reflective exercise. What we produce has an indelible effect on our conscious and unconscious working lives. The trained mind is responsive to an audience’s needs and is, in turn, more critically aware of strategy and argumentation. It is worth reminding ourselves that the task of writing is not its own end. Legal writing is a means of conveying knowledge and persuasive argument. There is always an audience to inform or convince, whether that person is an officer of the State or the Court, or a layperson. The quality of our legal writing will determine whether we are up to the task. There are many aspects to the legal profession worthy of our scrutiny. Some of the more minor aspects, however, may pass under the radar unless we pay attention to detail. For instance, what of the Juris Doctor (J.D.)? An invention of Harvard Law School in 1870, the degree is the professional equivalent of the M.D. Yet we don’t refer to our lawyers as doctors. (That is, in Australia or the U.S.: some Europeans, among others, apparently do call their lawyers doctors!). Given today’s full fee degree goes for the price of a first home mortgage, that oversight, whether purposeful or not, seems to give short shrift to those of us who laboured through three gruelling years of graduate education, on top of three or four years of undergraduate studies. The Americans, to their credit, allow their lawyers to affix Esquire as a post-nominal title, which seems to flout the traditional privilege of the genteel class. It may also mislead non-lawyers in the belief that their advocates are of gentle birth. But I suppose the American tradition harkens back to the days when lawyers were of the gentlemanly class. The Melbourne J.D., for example, does incorporate a degree of research work, so what should one make of the doctoral status? Perhaps we should disabuse ourselves of the doctoral status and re-nominate the J.D. to stand for “Degradus Juris”.1 Simply put: the law degree. And for the sake of plain speech, let’s also tidy up the remaining LL.Bs and their graduate relative, the LL.M. Some might consider the above proposals as themselves superfluous. However, I highlight only that these proposals are made in the spirit of plain speaking and simplicity that we seek to bring to other, perhaps more important aspects of the law. 1 Although the new term might call attention to the etymology common to “degree” and “to degrade”: not that one would mean to degrade the profession by simplifying its terminology!